Cootamundra is a town in the South West Slopes region of New South Wales, Australia and within the Riverina. It is within the Cootamundra-Gundagai Regional Council. At the 2016 Census, Cootamundra had a population of 6,782. It is located on the Olympic Highway at the point where it crosses the Muttama Creek, between Junee and Cowra. Cootamundra is not on the Hume Highway, but its railway station is on the Main Southern line, part of the Melbourne-to-Sydney line. Abb McAlister is mayor of the Cootamundra-Gundagai Regional Council. Cootamundra is the birthplace of Sir Donald Bradman AC, an Australian cricketer universally regarded as the greatest batsman of all time. The town features the Sir Donald Bradman Birthplace Museum, a fully restored visitors' site, the home where "The Don" was born, featuring cricketing memorabilia and artifacts. Cootamundra is the home of the Cootamundra wattle. Every year there is a large 'Wattle Time' Festival held at the time the wattle starts to bloom, with an art show and festivities. The earliest people to live in the area where present day Cootamundra exists are considered to be the tribe of Wiradjuri, with the name probably deriving from their word guudhamang for "turtle". Cootamundra was incorporated as a township on 9 August 1861, and the first settlers bought their lots in early 1862. Like many other towns in the Riverina, it was originally populated by those attracted by the gold rush of the 1860s but became a quiet yet prosperous agricultural community after the local deposits were exhausted. The town's rugby league team competed in the Maher Cup. 1862 - Gold mining commences at the nearby 'Muttama Reef' mine. 1875 - The first school in the district opens. 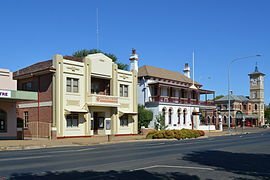 1884 - Cootamundra is first gazetted as a municipality. 1911 to 1968 - Cootamundra Domestic Training Home for Aboriginal Girls forcibly taken from their families. 1912-1974 - The former Cootamundra Hospital and Cootamundra Aboriginal Girls' Training Home were built upon a hill north east of Cootamundra. The property consists of a large parcel of land which had room for buildings as well as orchards and livestock such as dairy cows. 1952 - Name of Cootamundry officially changed to Cootamundra. 1955 - The first Cootamundra Annual Classic cycling handicap race, one of the oldest open races in NSW. 1960 - Cootamundra's Australian Football club is established. 1982 - In November 1982, the aviation company was formed. This was restructured in June 1993 after the death of its owner. 1986 - Popular Australian singer/songwriter/bush poet John R Williamson released his song 'Cootamundra Wattle'. 2015 - Australian youth radio station Triple jjj featured the 'Cootamundra bonus weather rap'. 2000 - The first annual beach volleyball competition. Truckloads of sand are deposited in the main street for "Coota Beach" (punning reference to Kuta Beach in Bali, Indonesia). Australian rugby league Kangaroos player Les Boyd grew up representing the Group 9 Cootamundra Bulldogs local team. According to the 2016 census of Population, there were 6,782 people in Cootamundra. Aboriginal and Torres Strait Islander people made up 5.6% of the population. 85.6% of people were born in Australia. The next most common country of birth was England at 2.1%. 91.6% of people spoke only English at home. The most common responses for religion were Catholic 30.8%, Anglican 28.4% and No Religion 16.4%. In The Two Ronnies' sketch "The Australians," Cootamundra is the location of their travel agency. Leonard Hubbard recorded the song "Cootamundra" in 1924. John Williamson recorded the song "Cootamundra Wattle" in 1986. Jack De Belin, Professional rugby league player playing for the St. George Illawarra Dragons in the NRL. Cootamundra railway station is located on the Main Southern railway line, with passengers served in each direction by twice daily NSW TrainLink XPT railway services between Sydney and Melbourne, and the weekly Xplorer railway services to Griffith. Cootamundra is hub for NSW TrainLink cross country coach services to Orange, Bathurst, Canberra, Condobolin, Tumbarumba and Mildura Regional Rail Logistics operates a containerised freight service from Junee to Sydney stopping in the town, with interstate freight trains also passing through. During World War 2, Cootamundra was the location of RAAF No.3 Inland Aircraft Fuel Depot (IAFD), completed in 1942 and closed on 14 June 1944. It was located in an area of land near the intersection of Olympic Highway and Thompson Street. Usually consisting of 4 tanks, 31 fuel depots were built across Australia for the storage and supply of aircraft fuel for the RAAF and the US Army Air Forces at a total cost of £900,000 ($1,800,000). ^ a b c Australian Bureau of Statistics (27 June 2017). "Cootamundra (State Suburb)". 2016 Census QuickStats. Retrieved 4 February 2018. ^ "Cootamundra". VisitNSW.com. Retrieved 17 June 2013. ^ McNicol, Sally; Hosking, Dianne (1994). "Wiradjuri". Macquarie Aboriginal Words. Sydney: Macquarie Library. p. 97. ^ "Cootamundra West Railway Station group". New South Wales State Heritage Register. Office of Environment and Heritage. H01119. Retrieved 18 May 2018. ^ "Cootamundra Railway Station and yard group". New South Wales State Heritage Register. Office of Environment and Heritage. H01118. Retrieved 18 May 2018. ^ "Cootamundra Aboriginal Girls' Training Home". New South Wales State Heritage Register. Office of Environment and Heritage. H01873. Retrieved 18 May 2018. ^ "Cootamundra Wattle". John Williamson. Retrieved 21 November 2018. ^ "Southee, Ethelbert Ambrook (1890–1968)". Australian Dictionary of Biography. Retrieved 2015-03-30. ^ "Primrose, Hubert Leslie". Australian dictionary of biography. Retrieved 2015-03-30. ^ "New rail service a boost for Riverina". The Daily Advertiser (Wagga Wagga). www.dailyadvertiser.com.au. 10 December 2008. Retrieved 2009-01-08.